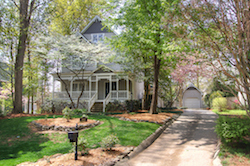 Absolutely stunning Victorian in popular Downing Place – just east of SouthPark near EVERYTHING Charlotte! Inviting porches,renovated kitchen with granite island, Corian countertops,large breakfast bay. Hardwoods throughout, plantation shutters and more! Incredible landscaping on one of the best lots in this popular Charlotte neighborhood. Stay tuned for more details and in the meantime, take the walk-through YouTube video tour for a sneak preview!